In Icinga 2, an event is the result of a service check, a downtime, notification or anything else that is currently happening inside Icinga. The Icinga API is pretty verbose about these information. By configuring types and creating filters, you can limit the events you want to store. When storing check results for example, you can compare log entries to monitoring events. Storing notifications help you identify noisy services and reduce false alarms. By comparing notifications with downtimes or acknowledgements you can find out how long it took the operators to react on problems. There are plenty of use cases when you have the data stored in an index that you can query. Elasticsearch uses the Apache Lucene engine and therefore its syntax is used to query the data. It’s not too complex and once learned you are pretty fast in finding what you are looking for. The visualisation methods provided by Kibana, the web interface for Elasticsearch, allow an accurate presentation of the information. When combining multiple visualisations in one dashboard you can create an overview over a certain topic. By polling the status of Icinga 2 you get an insight on how your monitoring environment is currently performing. The amount of host and service checks are metrics that give you a feeling about how your monitoring environment has grown over time. 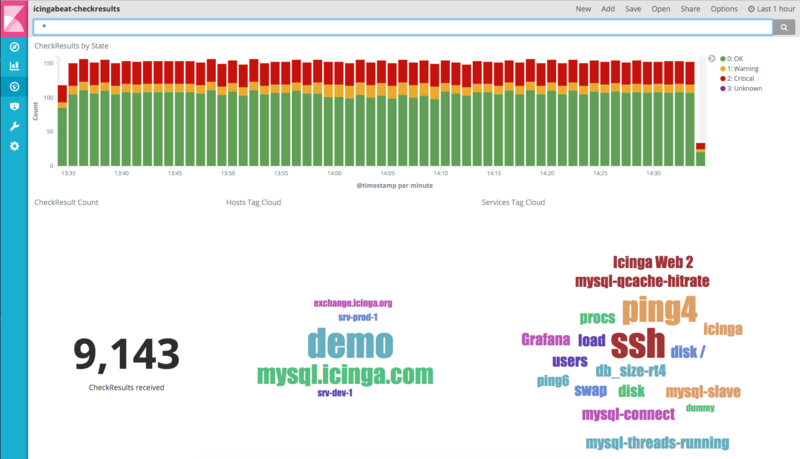 Checking the number of MySQL queries or the average execution time of plugins help you to find bottlenecks and make your Icinga 2 even faster. Icingabeat is lightweight and easy to install, we provide packages for all common operating systems on the release page. Packages will soon be available through our repositories on packages.icinga.com. For your convenience, we’ve added some sample dashboards that you can import with the included import_dashboard script.